Wesley Y. Leonard received his Ph.D. in Linguistics at the University of California, Berkeley, and is currently an assistant professor of Ethnic Studies at the University of California, Riverside. His primary research examines and theorizes various sociopolitical factors that are intertwined with Native American language endangerment, documentation, and reclamation. A citizen of the Miami Tribe of Oklahoma, he focuses in particular on the reclamation of his tribal nation’s language, myaamia (Miami). He is especially interested in building capacity for Native American languages in ways that support tribal sovereignty and survivance, and has developed several workshops on culturally appropriate application of the analytical tools of Linguistics for language reclamation purposes. 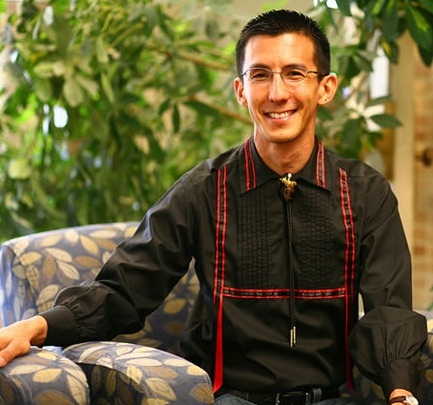 In a more recent collaborative project, he has been exploring how to apply the intellectual tools of Indigenous peoples to linguistic science. His work has appeared in scholarly outlets including the American Indian Culture and Research Journal, Gender and Language, Language Documentation & Conservation, and Language Documentation and Description. The LSA Member Spotlight highlights the interests and accomplishments of a different LSA member each month. Click here to see previous Member Spotlights. I joined soon after I began my PhD program in Linguistics, which was in 2000. Although I presumably would have eventually become a member regardless, I recall that Sharon Inkelas, who was teaching the proseminar that fall for new PhD students, emphasized the importance of joining the LSA. I think her advice was good, and appreciate that the LSA did, and continues to have reasonable student membership rates. How have you been involved with the LSA since you joined? My initial involvement was largely through quiet observation -- reading LSA newsletters and announcements, learning who did what in the field, trying to gauge what the LSA was all about, and so on. I attended my first summer institute in 2001 (Santa Barbara) and my first annual meeting in 2002 (San Francisco), and have attended and presented at about half of the annual meetings since. I have recently been collaborating with other Native American linguists in a project to promote Indigenous needs and ways of knowing in linguistic science, the biggest part of which thus far entailed collaborating with the LSA to put on the Natives4Linguistics satellite workshop at the 2018 annual meeting in Salt Lake City. I have also had the privilege of being part of current efforts to articulate a statement about race for the field. While not directly an example of service to the LSA, I am honored to serve on the Executive Committee of the Society for the Study of the Indigenous Languages of the Americas (SSILA), which is a sister society to the LSA. What are you currently researching/working on? While my primary focus is on the sociopolitical aspects of Indigenous language reclamation and in applying the associated Indigenous needs and ways of knowing to this work, I am very excited about a recent project that explores how the same Indigenous community needs and intellectual traditions can be applied to linguistic science in general. For instance, how can Native American definitions of “language” (which are usually very different from the structural and cognitive definitions of use in the field now) guide how linguistics is taught, how research projects get developed, or how scholars describe languages? I have been working with a fantastic group of collaborators to draw attention to such Indigenous ways of doing linguistics. This is the primary objective of the “Expanding Linguistic Science by Broadening Native American Participation” project funded through the National Science Foundation/National Endowment for the Humanities Documenting Endangered Languages Program (Grant no. BCS-1743743). The Natives4Linguistics workshop at the 2018 LSA meeting was the first major part of this project, and we’re currently working on disseminating our findings and creating long-term structures such as a Natives4Linguistics LSA special interest group to facilitate project goals. How has the field of linguistics changed since you first started your work? Well, there are still a few linguists who still claim that myaamia (Miami) is an “extinct” language (even though members of my community reclaimed it from documentation and now speak it), but this is a LOT less common than it was in the 1990s and early 2000s when I was first engaging with the field. This is a very important change for others who share my background: it’s not easy to function in a field whose prominent scholars insist that your language is extinct, or say that reclamation work isn’t real research. More generally, the language reclamation work that I do has become much more common and accepted in the field, as has social justice-oriented language work in general (though I did learn through recent research about how prevalent it still is for linguists to be told their work isn’t “real linguistics”). A related shift has been in the recent growth of work in Indigenous language documentation and description, which is something I welcome, though I worry about the colonial analytics that sometimes accompany this work. What advice would you give to students interested in pursuing a career in linguistics? I say, “go for it!” -- but as part of this, I also share my critique of how the field largely reflects the intellectual and cultural norms of dominant social groups, despite its focus on diverse languages. Stated more specifically with respect to my own background, Native American languages are of tremendous interest to the field, but there are very few Native American linguists in the field, particularly at the PhD level; not surprisingly, Native American epistemologies and protocols are thus not widely known or respected. A common issue among Native American scholars is that we are expected to think and act in Euroamerican normative ways, where, for example, our languages becomes objects of study rather than core parts of our peoplehood and sovereignty. My advice to students is to value their own cultural backgrounds and to recognize that their values and experiences can enhance linguistic science, even if some of their mentors/teachers aren’t aware of this. My associated call to the people who are currently in the mentor/teacher role is to be aware of this, and moreover, to be thoughtful when presenting linguistic science to others. Here’s a specific example to consider: Common in Indigenous community contexts is for language and peoplehood to be considered heavily intertwined. From this point of view, representations of a language become representations of the people who claim it. As such, talking about a language as an object whose value lies in what it reveals for linguistic theory can reduce the people to their value for science, which evokes a general colonial practice of exploiting the colonized population for its resources. What, in your opinion, is the most important service the LSA provides to its members? To the field? There are a lot of valuable services, but the easy answer is that the LSA brings people with shared interests together so that we can learn from each other and address issues in ways that none of us would be able to do on our own. The annual meetings and institutes are the most obvious examples of this, but I also think of virtual training sessions and professional journals as valuable methods of bringing people together. Is there anything else you'd like to say to the LSA membership as a whole? I hope that my ideas about what’s important emerge naturally throughout my answers. One specific additional point I want to emphasize is that while I have always been taught that “linguistics is descriptive, not prescriptive”, I am now convinced that this is not true. That the field is “descriptive” relative to broader social norms of referring to non-standard ways of speaking as “wrong” may be true, but I emphasize that language description is inherently prescriptive, at least to some extent. This occurs because it is people who create and use it, and these people exist in a complex web of environments and power relations. Trusting that linguistics is always descriptive masks how statements that may be descriptive in their intent can take on a prescriptive overtone due to the contexts in which they are presented. In the language reclamation contexts I work in, the prototype is that “description” is produced by a linguist who is not a member of the heritage community, and who enjoys a relatively high level of prestige due to association with the academy. The prototypical users of this description are Indigenous community members whose knowledge systems are not widely recognized as valid intellectual orientations, especially with respect to contemporary scientific norms of analyzing language. In such contexts, comments from linguists like “this is how language X’s grammar works” can come across as fixed truths rather than what they actually are -- analyses by specific people who are operating in a specific scientific tradition. I think it’s crucial that we all be conscious of this phenomenon and that we likewise be cognizant of our social positions and assumptions as we do our work.